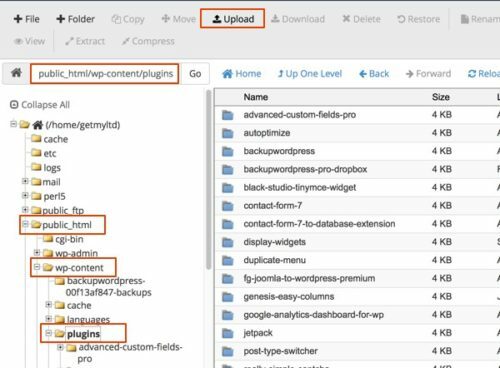 WordPress makes it pretty easy to install plugins, but if you’ve never done it, this tutorial will help. I’ll explain how to install WordPress Plugins using the built in WordPress plugin. In addition, I’ll explain how to install WordPress manually using ftp. Using the built in plugin installer, all plugins install the same way: find the plugin you want to use, click Install, and then, after the plugin is installed, Click Activate. The WordPress plugin directory contains over 44,541 plugins. All plugins in the WordPress.org plugin directory are free. Free to try, anyway. With most free plugins, you get a fully functioning plugin for free. With other plugins, WooCommerce Shopping Cart Plugin, for example, you get the basic shopping cart features you need to run a simple online store. But if you want payment gateways other than Paypal, or you want live shipping quotes from UPS, you’ll have to buy a plugin. In the case of most paid plugins, you can get a decent working version for free at WordPress.org. You get to take it out for a test drive. I often find the free version is more than adequate for my project. But if not, I buy additional plugins from the developer to add more advanced functions. How do you Find the Plug You Want? Finding the plugin you want is tricky when you first start to look for plugins. First, you often are not sure what the plugin would do or how to seach for it. Here’s a case of needing a Widget with a vidual editor, like the visual editor used on posts and pages. Unfortunately, the default text widget included with WordPress allow only text. But there is a much better text widget that has both a text and visual tab. This visual tab in the editor allows you to easily as bullets, headings, images, and links, to name a few, without writing any code. To start your search for a widget with a visual text editor, from the WordPress admin, go to Plugins > Add New. Enter Visual Editor Widget in the search field and hit your return key. Wordpress returns relevant results…we hope. When you get back multiple results, how to you know which one to pick. – Look at the number stars and comments: 2 comments with 5 stars is not a reliable sample group. 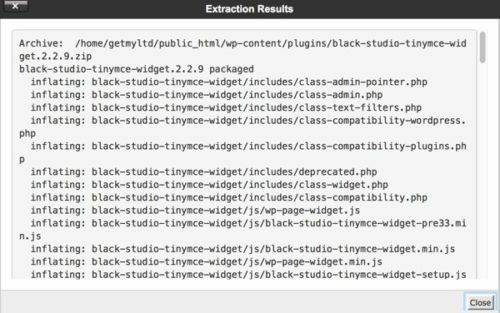 The Black Studio TinyMCE Widget plugin has 5 stars from 141 reviews and 800,000 active installs: that’s a very good recommendation. – When was it last updated, and it is compatible with your version of WordPress. – Read the reviews and the support tab. See if the plugin developer responds to questions. IMPORTANT: Before you install any plugin, make a complete backup of your website: all files and the database. Once you find the plugin you want, click Install. If all goes well, WordPress installs the plugin. If you plugin is a widget or if it add additional function, then look in Settings to see if there is a settings page for the plugin. Now you’re ready to go. If the plugin is a widget, then go to Appearance > Widgets and you will see a new widget. In my example, the Black Studeo TinyMCE widget is titled Visual Editor. 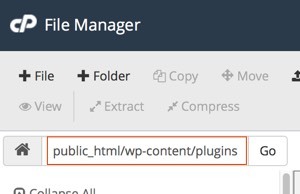 You can install a WordPress plugin manually using your web host cPanel. Why would you want to install a plugin manually? Maybe you can’t get the WordPress plugin installer to install the plugin. Search for the plugin you want. Once you find it, click the Download button and save the plugin zip file on your computer. Make sure the plugins directory is the current directory. From the top menu, click Upload. The File Upload screen opens. Click Select File and navigate to the plugin zip file and select it. File Manager uploads your file and shows 100% when file is uploaded. Return to the File Manager screen, select the plugin .zip file, and from the top menu, select Extract. File Manager extracts the zip file and displays the Extraction Results screen. Close the Extraction Results screen. After you have verified that the new plugin folder was created, delete the plugin .zip file. Log into the WordPress admin, go to Plugins > Installed Plugins, and activate the plugin. The plugin is now installed and you can use it.